At the start of the Samsung Galaxy S3 in May, Samsung offered only the two colors Pebble Blue and White Marble for its customers. A short time later then appeared exclusively for the U.S. provider AT & T nor the color Garnet Red Recently, it also announced that it will be the Samsung Galaxy S III will also show a held in Sapphire Black model. 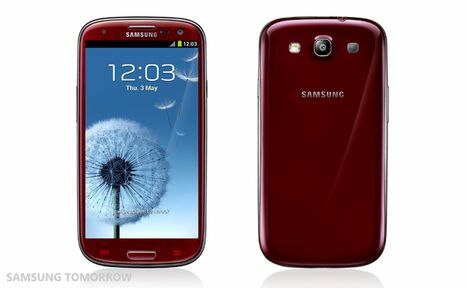 Thus it was thought that these 4 colors along it has been now for the Samsung Galaxy S3. However, Samsung has now announced a total surprise 2 more Faben for the Galaxy S3, a model in Amber Brown and a Samsung Galaxy S3 in Titanium Grey. Whether, however, these colors of the Samsung Galaxy S3 are reserved exclusively for providers, is still unclear. Samsung states that the 4 new colors of the Samsung Galaxy S3 are inspired by nature. As it stands, the red and black Galaxy S3 have like the white model seems an optically smooth backside. The variations in brown and gray, however, have the blue Samsung Galaxy S3 as a visible but not noticeable structuring.